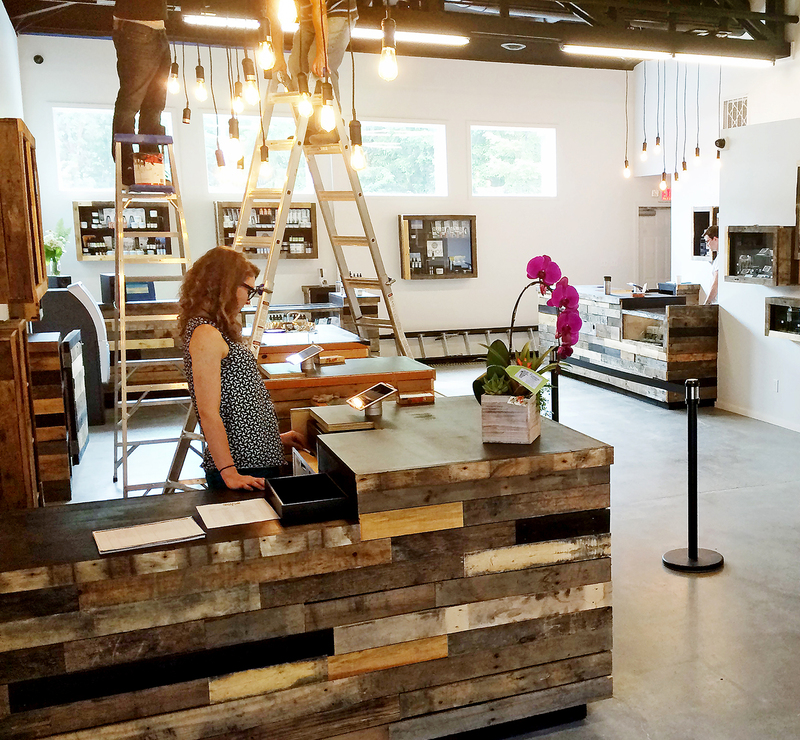 Bainbridge Island’s first and only retail marijuana shop could pass for an art gallery or café with its natural light, neutral color scheme, vinyl music and refurbished wood décor, if not for the smell of marijuana. Even the name, Paper & Leaf, doesn’t reek of weed clichés. Owners Steve Kessler and Brendan Hill held the company’s grand opening Wednesday, after having a soft opening for friends and family June 20. The 1,800-square-foot store is just off Highway 305 in the industrial park at 8040 Day Road. Although state regulations won’t allow more than one retail shop on the island and Paper & Leaf won’t have competition within a 30 minute commute, it is doing business a little different from other pot stores around the Sound. 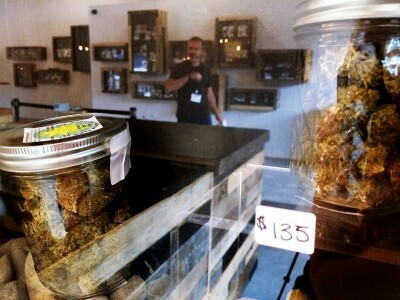 Shoppers won’t find candy-like edibles for one. While islanders strongly supported legalizing marijuana, there was a concern about can candy edibles appealing to children and minors, Kessler said. About 70 percent of the island’s voters backed Initiative 502, which legalized marijuana in 2012, compared to 56 percent statewide. Instead of candy edibles, Paper & Leaf has liquid products customers can drop directly into their mouths or use to bake. When using products for the first time, Kessler suggested taking it slow. “I always tell people, ‘Less is better,’” he said, especially with edibles that can take up to two hours to take affect. 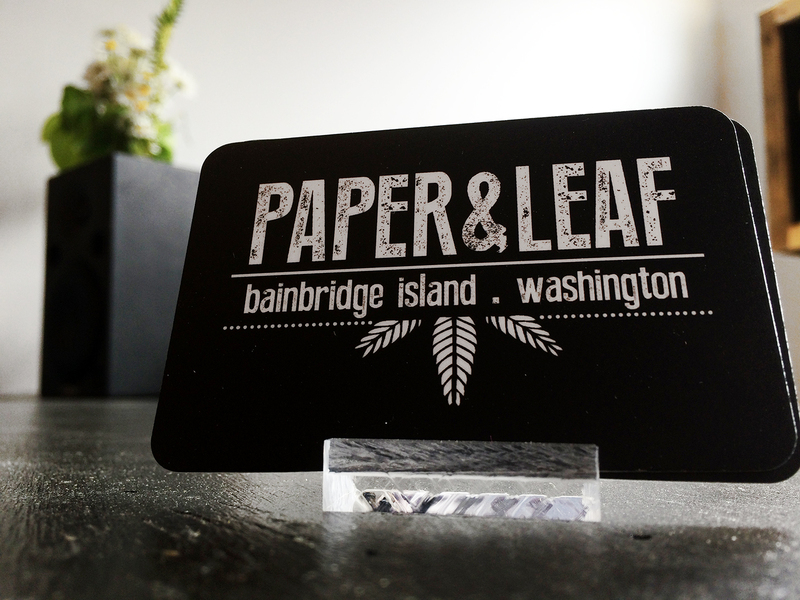 How Paper & Leaf displays its marijuana products also is a little different from most. They are all locked in wood and glass cases on the walls and not behind the register. Producers, including several locals, have their own case with a variety of strains. 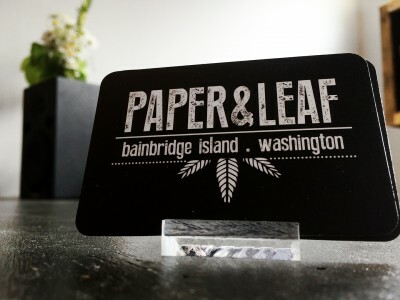 More than half of Paper & Leaf’s producers are in Kitsap or North Mason, Kessler said. Product not only arrives faster with closer producers, he added, it’s a way of supporting other local business. Marijuana isn’t the only local item Kessler and Hill want to hang on the wall. One long, blank wall by the store entrance will eventually feature artwork from local island and area artists. The first exhibit will be a history of cannabis, Kessler said, although future exhibits can be unrelated to marijuana. The art is part of a goal to create a relaxed atmosphere at Paper & Leaf. To add to the vibe, customers can talk with staff or among themselves — as some did Wednesday — at a long table made from reclaimed wood by the local Coyote Woodshop. Even with a relaxed feel, security is tight. There are 28 cameras throughout the parking lot and every room in the business, except the bathroom. Kessler and Hill also had motion detectors, automatic locks and broken glass sensor installed. 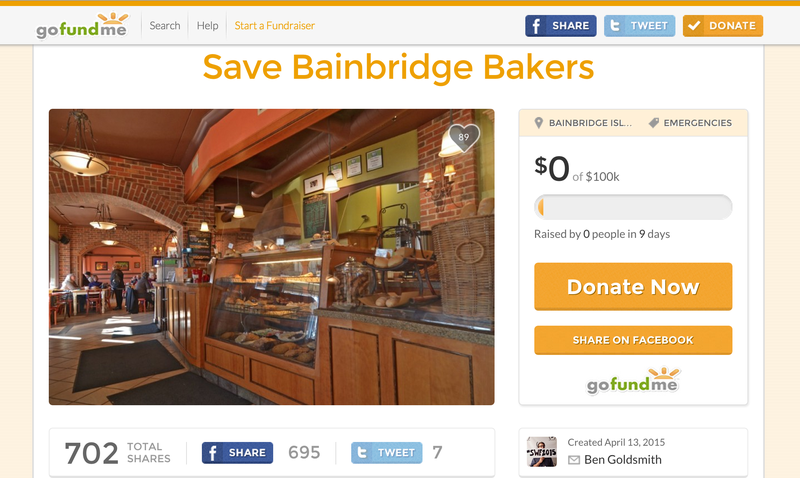 Bainbridge Bakers has canceled the GoFundMe campaign started by one of its employees, said owner Mike Loudon on the company’s Facebook page Wednesday night. Labor and Industries confirmed it’s investigating five wage complaints lodged against Bainbridge Bakers this year. The GoFundMe campaign was started last week to help the 29-year-old business, asking for $100,000. About $6,000 had been donated the day after the campaign launched. Donors can expect a refund in 2-5 days, according to Loudon’s Facebook post. The bakery closed around noon today, with a notice posted saying it would remain closed through Sunday for restructuring, said Ben Goldsmith, who started the GoFundMe campaign. Tim Kelly, editor of the Kitsap Peninsula Business Journal, contributed to this post. A nearly 5-acre development is being proposed off Lynwood Center Drive for residential and business space, along with a park. Blue Moon & Roost Land Companies, LLC has plans for multiple homes, town houses, a hotel and rooftop restaurant and bar, along with office, retail and artist space. While the Lynwood Center buildings have a Tudor style, the developers architect said the project will not be the same style. INDIGO Architecture & Interiors does not “interpret” the center’s design guidelines require the Tudor style. The proposal did not say what specific style would be used in the development. Housing would be the first phase of the project, including five 2,000 square-feet single family houses with 800 square-feet mother-in-law homes, two 1,700-square-feet single family houses and six town house units above commercial space. The project’s second phase would be three three-story buildings about 9,000 square feet each. These buildings would include a hotel called Hotel Charrette, rooftop restaurant with water views, ground-floor retail with room for working artists and second floor office space. There also will be six “inn cottages” called Gypsy Wagons by the proposed park and a market plaza along Point White Drive. An existing brick house on the site will be renovated and used for commercial purposes. The site was previously a lumber yard and the rest of the property has been used as a pasture for the last 40 years, according to INDIGO’s proposal. The Larson Lumber building is still on the site. Developers also said in the proposal that they want to keep as many of the trees as possible, including a pine by the market to use as a holiday tree. There will be a public meeting Monday night to address questions. See drawings of the proposed development. 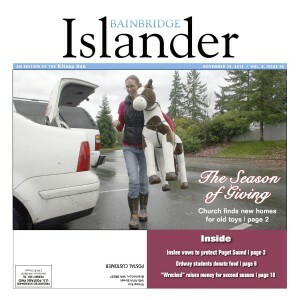 WHEN: Monday, Jan. 26 at 6 p.m. to 7:30 p.m.
We are asking readers to rank the top Bainbridge Islander stories from this past year in a survey. The top 10 will be posted on this blog. You can take the survey here. 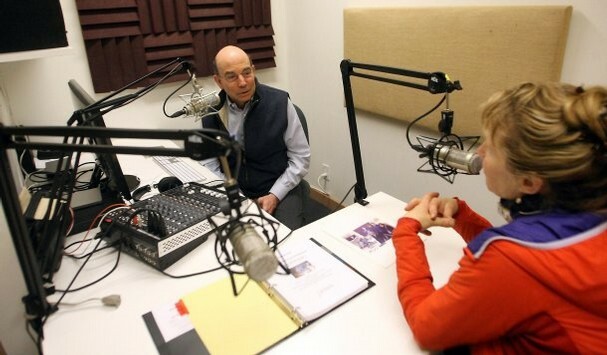 Bainbridge Community Broadcasting project manager Barry Peters, left, and voice-over artist Kayla Black test the new equipment in the studio in March. Bainbridge’s long awaited radio station has arrived – at least in the form of podcasts. Bainbridge Community Broadcasting is now offering six podcast radio shows titled “What’s Up Bainbridge.” The 5-minute podcast previews of an upcoming local event “described in person by the organizer, artist or presenter closest to the event,” according to an email from BCB announcing the podcasts. The radio shows are available at www.BestofBCB.org. In March, Bainbridge Community Broadcasting switched from the planning phase to training when it received its new three-microphone studio. Bainbridge Community Broadcasting is awaiting a decision from the Federal Communications Commission this summer on its application for a low-powered FM radio license. You can add vodka to the list of things Bainbridge Island is known for after Bainbridge Organic Distillers’ Legacy Organic Vodka was crowned the “World’s Best Vodka” at the World Vodka Awards in London recently. More than 1,000 brands from 25 countries entered the 8th annual competition that also includes the best brandy, calvados, cognac, gin and rum. An independent tasting panel that included journalists, retailers and industry reps judged the entries. Bainbridge Organic Distillers, which plans to release its Legacy Organic Vanilla Vodka next month, can be found in fine restaurants and retail outlets in Washington state and California. Harrison Medical Center is seeking approval of a 25,000-square-foot building to be constructed near the intersection of Highway 305 and Madison Avenue. The hospital hopes to break ground on an initial 17,000-square-foot phase this fall and open the center by the winter of 2014. Today Harrison sent us artist’s renderings of how the initial phase might look on the site. 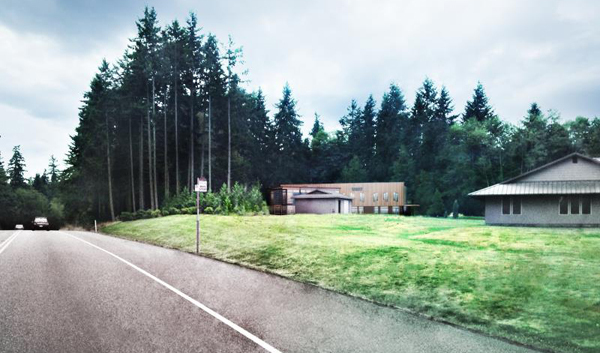 The rendering below shows a view of the proposed building from southbound Highway 305. The proposed center would offer 24-hour urgent care, primary and specialty care, and lab and imaging services. 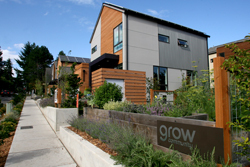 Construction on the first phase of Bainbridge Island’s Grow Community is well underway on the corner of Wyatt Way and Grow Avenue. Now developers are retooling designs for the second phase, planned for five acres between Wyatt Way and Shepard Drive, just west of the Pavilion complex (currently the site of John Adams Lane). The new preliminary site plan (a rough rendering is shown above) shifts the focus from single-family homes to a mix of apartments, condominiums and townhouses. Island architect Jim Cutler has sketched plans for 87 homes clustered into two distinct neighborhoods, each centered around a common area. Most of the resident parking will be located underground to allow for about three acres of open space above. A community center building is planned for the center of the courtyard to the south. According to developers, the new buildings will still be built to meet the One Planet Living standards achieved in the first phase of Grow. This includes space for solar panels on the rooftops. Developers plan to submit a revised site plan to the city for review in September. 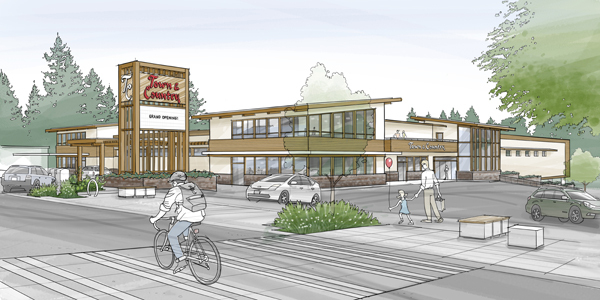 Town & Country Market released an artist’s rendering this week for a proposed remodel of its iconic Winslow store. The project will bring the market onto a single story and generally modernize the 56-year-old building. The familiar reader board sign on Winslow Way will remain intact. T&C first announced the proposed remodel in 2012. The company filed an initial project application with the city Thursday, according to a news release. Remodeling work could begin in early 2014 depending on the permit timeline. Island architects Devin Johnson and Priscilla Zimmerman are designing the project. Tom Chiado is project manager. Abbott Construction of Seattle is the general contractor. Company representatives say the extensive remodel signifies T&C’s commitment to staying put in downtown Winslow. 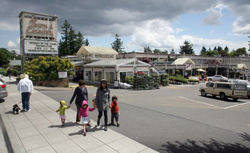 The Loverich and Nakata families opened the Winslow market in 1957. The store expanded in 1990, adding a cafe and floral department. Town & Country Markets now operates five stores. Apartments, a gym and a community swimming pool are all part of the proposed second phase of Pleasant Beach Village at Lynwood Center. A public meeting was held for neighbors of the project on Monday night. Weather: It looks like we’re back to our regularly scheduled fall weather. The National Weather Service predicts clouds and rain showers this weekend with temperatures in the 40s. Sports: Spartans hoopsters don’t get much of a holiday. The boys basketball sees its first action at a South Kitsap High School jamboree at 7 p.m. Saturday. The girls start their season at Bremerton Monday and wrestling visits North Kitsap for a tournament Wednesday. See a full Spartans schedule here, and follow the Sun’s Prepzone on Facebook for updates. The post-Thanksgiving weekend calendar is a little sparse, but there are a few events worth checking out around town. 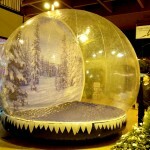 The Winslow Mall will debut a giant inflatable snow globe today (pictured sans snow), which shoppers can climb inside of. The attraction is a fundraiser for the July Street Dance and will be open 10 a.m. to 7 p.m. each weekend during the holiday season. KiDiMu will raise it’s Giving Tree Saturday in support of Helpline House’s holiday program. Families can pick gift tags from the tree and bring unwrapped presents to the museum until Dec. 8. Contributing families receive a free pass to KiDiMu. Monday is your chance to meet Bainbridge’s new city manager. Island forum VillageSpeak will host a potluck and discussion with Doug Schulze at 6:30 p.m. at the Office Xpats center in the Bainbridge Pavilion. Pick up this week’s Islander for more event listings and tell us about your events in the comment section below. Inside the Islander: Young Bainbridge filmmakers hope t0 make second season of their web-based sitcom. 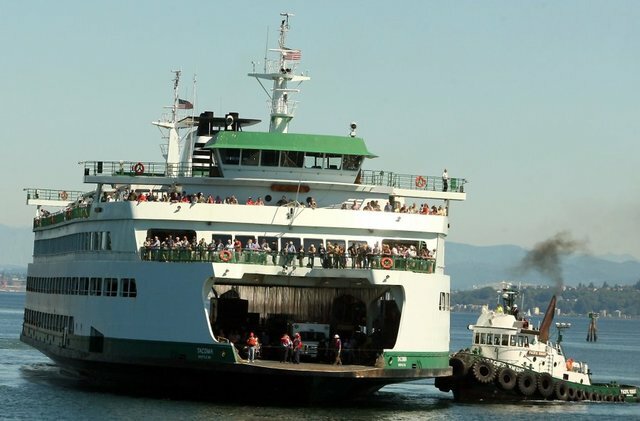 A problem at the Eagle Harbor maintenance yard last week sidelined the ferry Walla Walla and forced WSF to downsize routes. We stopped by the Gift Giving Exchange on Saturday to see how the present “recycling” program works. About 6,000 Bainbridge homes and businesses lost power Monday as a wind and rain storm swept the region. Police Cmdr. Sue Shultz was placed on administrative leave Monday. The reason for the suspension was not released. Two Downtown Association volunteers are compiling the history of every Winslow Way storefront. Find out how to help here. Coming Up: Check the Kitsap Sun today for photos from the Thanksgiving Turkey Trot. Follow us on Facebook and Twitter for updates throughout the week. Contact Bainbridge reporter Tad Sooter at tad.sooter@gmail.com. The island’s ban on plastic shopping bags begins Thursday. We’ve posted some of the basics below. Let us know what you think of the bag ban by taking our poll below or leaving a comment. The City Council unanimously approved the bag ban this spring as a way of reducing litter and unnecessary waste, while promoting reusable bags. Bainbridge is the fifth Washington city to ban plastic bags and the first in Kitsap County. Seattle banned plastic shopping bags in July. Starting Thursday, retailers are no longer allowed to provide those thin, single-use plastic bags at checkout. Paper bags will still be available, but the ordinance requires retailers to charge 5 cents for larger paper bags (this doesn’t apply to qualifying low income shoppers). There are a few exceptions to the ban. Plastic bags are allowed for restaurant take-out food, produce, greeting cards, small hardware items, newspapers, dry cleaning and waste. What stores does this apply to? Short answer: All of them. This ban applies to all retailers across the island, not just supermarkets. It also applies to farmers markets and vendors at festivals. Food banks can still use plastic bags. Where can I get reusable bags? 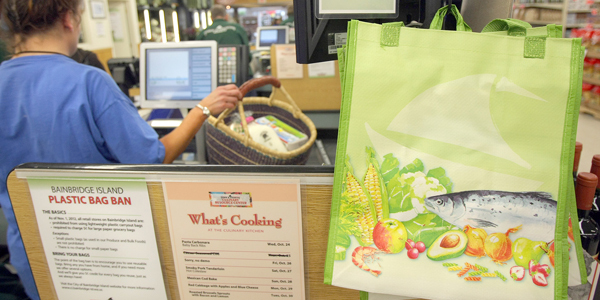 Reusable bags are available at island grocery stores and some other retailers. The city is handing out a cloth “Bainbridge Bag” tonight during the Winslow trick-or-treat event from 4-6 p.m, and at the library and City Hall starting Thursday. The city has more details and links on its Sustainable Practices page. If you’re interested in the nitty gritty, you can read the ordinance here. Watch for a full bag ban story Thursday in the Kitsap Sun. 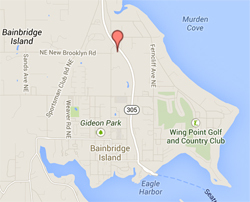 What do you think of the Bainbridge plastic bag ban?